Programs like mobile phone connection optimizer software may install the Winsock Base Service Provider (BSP). BSPs sometimes bypass the Firewall client. To raise an alarm about the situation, ISA Firewall client displays one of those ugly yellow exclamation marks on the system tray icon. If you hover your mouse over it, it shouts “Firewall client is not installed properly”. An example of software that causes this condition is AT&T Comms Manager. Open REGEDIT, find the key “HKEY_LOCAL_MACHINESOFTWAREMicrosoftFirewall Client 2004Policies” and add a new “DWORD” value “UiEnableCatalogValidation” and set it to “0″ (zero). Microsoft has unveiled the new ISA Firewall Client that runs on Windows Vista, Microsoft’s latest addition to flagship Windows operating system series. Client operating systems: Windows NT, Windows 2000, Windows Server 2003, Windows XP and (of course) Windows Vista. 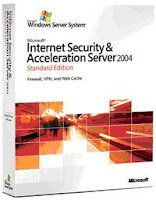 ISA Server versions: ISA 2000, ISA 2004 (Standard & Enterprise), ISA 2006 (Standard & Enterprise).